Free Cuba: Why Cuba's infant mortality rate is higher than that of the United States. Why Cuba's infant mortality rate is higher than that of the United States. Rule #1 to understanding Cuba: The Cuban government lies. Nicholas Kristof has written an OpEd in The New York Times that is at best irresponsible titled "Why Infants Maybe More Likely to Die in America Than Cuba," and relies on Cuban government statistics to make his case. 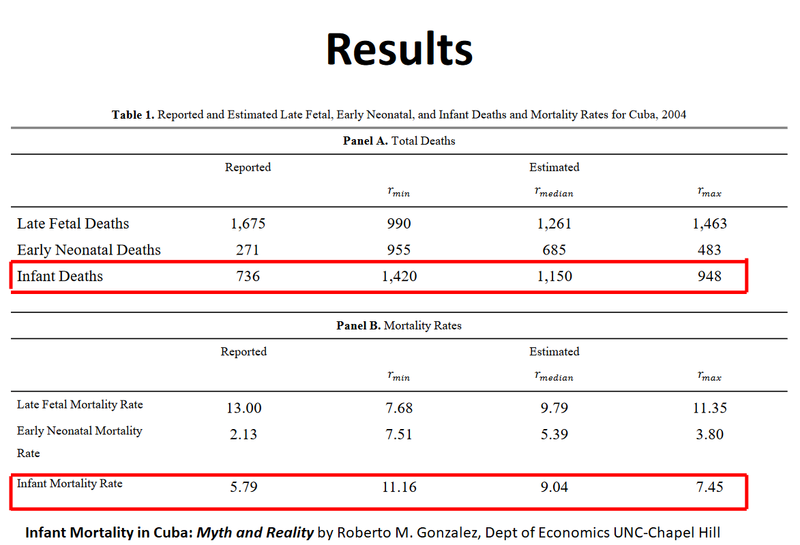 The claim made is that the infant mortality rate (IMR) in Cuba is only 4.0 deaths per 1,000 live births and that in the United States it is 5.9 and that due to this Americans should copy aspects of the Cuban healthcare system. The trouble is that the number provided by the Cubans is a fabrication. Roberto Gonzalez at the University of Chapel Hill provides an analysis that explains this in detail.The chart above gives the actual estimate of the IMR in Cuba with a median estimate of 9.04 and a range that begins at 5.79 and extends up to 11.16. High rates of abortions to do away with problem pregnancies is also a factor for the IMR rate in Cuba. Katherine Hirschfeld, an associate professor in the department of anthropology at the University of Oklahoma, in her book Health, Politics, and Revolution in Cuba Since 1898 describes how her idealistic preconceptions were dashed by 'discrepancies between rhetoric and reality,' she observed a repressive, bureaucratized and secretive system, long on 'militarization' and short on patients' rights. "Public criticism of the government is a crime in Cuba," and as a result "formally eliciting critical narratives about health care would be viewed as a criminal act." Hirschfeld also says that because Cuba recognizes that its health care system is a key way to impress the rest of the world, there is pressure to paint an overly rosy picture. In addition, Hirschfeld says that "individual doctors are pressured by their superiors to reach certain statistical targets," and face the possibility of being fired if there is an increase in infant mortality in their district. "There is pressure to falsify statistics," Hirschfeld says. The focus on outcomes may also lead to heavy-handed patient care. According to Hirschfeld, "Cuba does have a very low infant mortality rate, but pregnant women are treated with very authoritarian tactics to maintain [favorable] statistics." 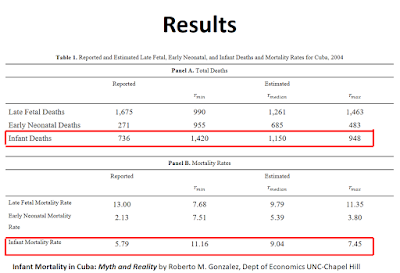 This means that Cuba's infant mortality rate is higher, not lower than the IMR of the United States, and Mr. Kristof is spreading falsehoods from the platform of The New York Times.